Well folks, meet the next generation. The new kittens have arrived and they’ve already taken over the kitchen and our lives. And this is just day 2! Please say a great big “Hello and Welcome” to Masters Dougal and Hamish; a couple of braw cats who hail from Auchtermuchty and came home to North Berwick via Newburgh. Dougal is black and white and Hamish is white and black. They’re a couple of months old and they’re cutest things on four paws. They are as cute as the cutest cute things on planet cute. We’re knee deep in feline paraphernalia – cat nip mice, bouncy spiders and a brilliant play tunnel. My arms are scratched to pieces and everything is going to wrack and ruin. I’m typing amid a cacophony of crashes and squeaks as they re arrange the kitchen and race round like mad things before collapsing into that deep deep kitten sleep. I’d forgotten just how wonderful kitten energy is and how hard it is to think of anything else when they’re about. 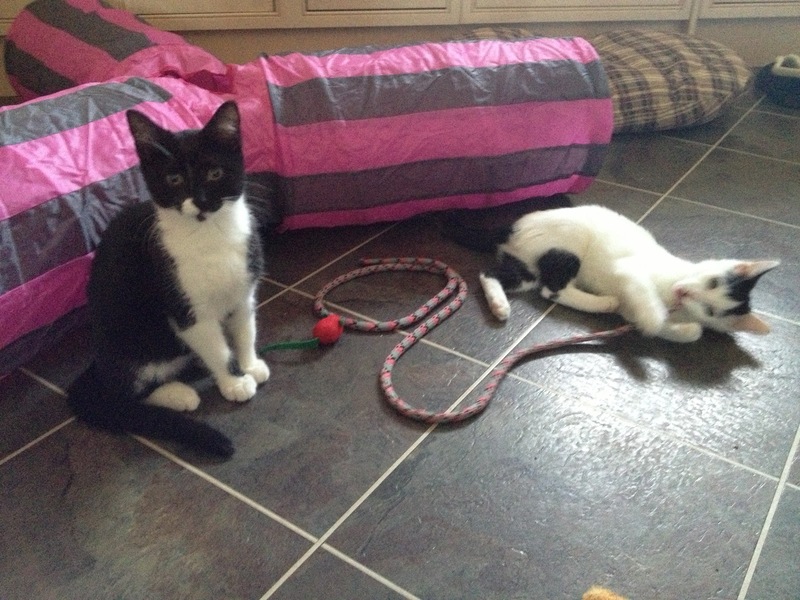 We picked the wee darlings up on Friday from their foster Dad Chris, a lovely man who gave them a great start to life. They were Dougal and Fred, but we thought Fred wasn’t quite right and so went for Hamish from the Radio programme. They are lovely affectionate moggies with the sweetest of natures. Their first night, we spent the evening on the kitchen floor helping them feel at home. Dougal, who’s big and beefy and looks so confident, immediately ran for cover via a rather tight squeeze behind the fridge. I don’t think Ali will ever recover from seeing Dougal jammed solid. We reckon that might be life number one gone; Dougal already has the air of a cat that gets into scrapes, something I’m sure you cat lovers will understand (and a good few parents too!). Hamish, who’s slight and delicate was out and exploring very quickly, but he kept his wits about him and kept his distance at first. Hamish was happy just playing with his ball of foil brought with him from Fife. By the next morning, Dougal was out from under the sink and under the radiator and Hamish was totally chilled. As we head towards the end of their second full day in their new home, their characters are beginning to emerge. Hamish is the quieter, more observant of the two. He starts things off and then Dougal joins in. Hamish is very like the lovely Bute; he looks similar and has already taken to the bit of climbing rope that Bute loved to play with; he has amazing reflexes and is very fast. Dougal is a serious purrer and very vocal. He can jump and is already trying to jump up onto surfaces way beyond his ability (famous last words!). They are playing with the intensity and commitment of Olympic athletes and it won’t be long before the bird table is at risk. So the next generation has arrived; there are cats once again in our house and all feels well with the world. Kittens for Christmas – what a lovely lovely thought.